Lower back pain is one of the most common types of pains people experience. Nevertheless, it is quite agonizing and can hamper a person’s productivity and capacity to carry out his or her daily chores efficiently. Lower back pain that lasts more than 12 weeks is considered chronic. There are various exercises for lower back pain. However before you start on with any of them, you have to consult your doctor or general practitioner to figure out the underlying causes of the pain. Exercises to relieve lower back pain should not be done before figuring out the reason. Exercises for lower back pain aim at building strength, tolerance and flexibility in lower back muscles and bones. Any exercise that sustains and strengthens the spine is recommended for relieving the pain. 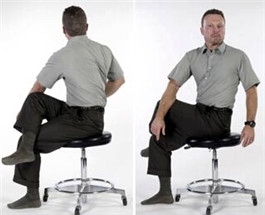 This exercise is simple and requires the person to sit on a chair or stool. A person who has a desk job with long hours can perform this any time of the day; even while working. It should be preferably done twice a day. While sitting straight and upright on a stool, the person has to cross his or her left leg over the right one. The person then has to move his or her torso in each direction for ten seconds. This step should be repeated for both sides for 3 to 5 times. These exercises start from low to high intensity and aim at helping supply oxygenated blood to muscles in the body. These cardiovascular exercises most commonly include walking, swimming and cycling. These exercises help in relieving back pain. They should be started from low intensity level and should gradually be increased in terms of duration and intensity. Apart from this, they also strengthen heart and lungs and help a person lose weight, which further relieves pressure from the lower back. However any exercise that requires the person to move and bend in extreme directions should be avoided. The person who experiences lower back pain should lie down on a floor with something under the head. Both the knees should be bended and held together. He or she has to then move the pelvic area and knees in one direction and then the opposite while taking a deep breath in each move. The knees should be moved on either side for about 8 times. The person has to make sure that the shoulders and arms should keep sticking to the floor and any movement that seems too uncomfortable or intense should be avoided. Bended knees should be moved on each side according to the flexibility of the person performing the exercise. Put your hands behind the neck. Tighten your stomach muscles and then raise your shoulders off the floor. Breathe out as you raise your shoulders. Like the name suggests, a person has to move forward with his or her hands, head and shoulders partially while lying on the back. The knees should be bended with feet kept on the floor. It should be done for 5 to 10 seconds while exhaling. It should be repeated ten times after each relaxation. In this exercise, the person has to lie on his or her stomach. The upper torso should then be raised on the support of elbows keeping the neck straight. The pelvic region and legs should keep sticking to the floor. The spine will arch backwards in this position and the person should be able to feel a slight stretch in the stomach. This position should be maintained for 10 seconds, by each time taking a deep breath. Initial position should then be adopted and this step should be repeated again for 8 to 10 times. This type of stretching exercise is good for mobilization of lower back. The person who performs this exercise should kneel in such a way that his or her hands should be directly below the shoulders and the knees should be below the hip. The elbows should be straight and the back should not be arched unnecessarily. The next step is to move the bottom towards the heels while taking a deep breath. It should be repeated for around ten times. This exercise requires the person to lie on his back with bent knees and feet on the floor. The person then has to bring one knee towards his chest while keeping the other one bent for about 10 to 15 seconds. It should be repeated with both knees one by one. Wall sits require the person to lean against the wall and slide down, making a sitting position with knees bent. The back would press against the wall in this position. Each session should last 10 seconds and should be repeated a few times. The person lies on the back with knees bent. The pelvis should be slightly bent upwards making the back touch and flatten against the floor. The position should be maintained for 5 to 10 seconds making the abdominal muscles taut. The step should be repeated after each relaxation. Lower back pain exercises are curbed through the technique of bridging. The person in this exercise lies on his or back and raises the buttocks upwards, keeping only the heels and not the feet on the floor. The person has to maintain such a position that the shoulders, buttocks and shoulders all are in one line. The exercise should be performed by keeping the stomach muscles tight, which prevents the spine from arching a lot. This position should be maintained for 5 to 6 seconds. Like all exercises it should be repeated several times. Not all exercises are beneficial for strengthening the spine. Sit ups and toe touches may seem like good exercises for lower back pain but can actually put pressure on spinal discs, ligaments and muscles therefore should be avoided if a person has lower back pain. Server responsed at: 04/19/2019 4:40 a.m.